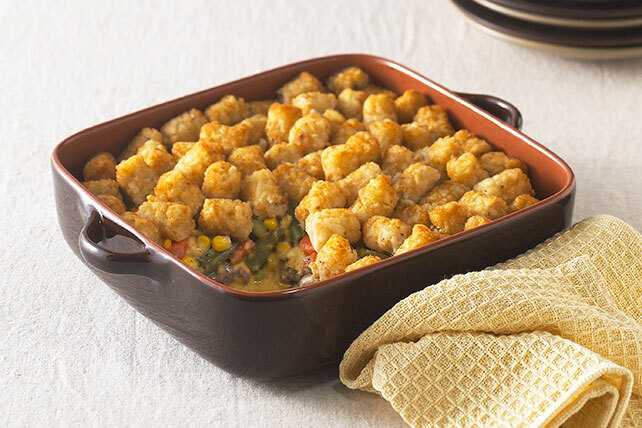 Enjoy crispy bites of potato atop this ground beef & veggie TATER TOTS Casserole recipe. We love good ol' fashioned comfort food like TATER TOTS Casserole. Brown meat with onions in large skillet; drain. Spoon into 2-qt. casserole sprayed with cooking spray. Mix soup and milk until blended; pour over meat mixture. Top with remaining ingredients. Bake 45 min. or until TATER TOTS are golden brown and casserole is heated through. Save 50 calories and 6g of fat, including 2g of sat fat, per serving by preparing with extra-lean ground beef, reduced-fat condensed cream of mushroom soup and KRAFT 2% Milk Shredded Cheddar Cheese. Substitute frozen peas or frozen corn for the frozen mixed vegetables.